You can pronounce C7 as either "C-seven" or "C-seventh." 1. Place your index finger on the B string, behind the 1st fret. 2. Place your middle finger on the D string, behind the 2nd fret. 3. Place your ring finger on the A string, behind the 3rd fret. 4. Place your pinky finger on the G string, behind the 3rd fret. 5. 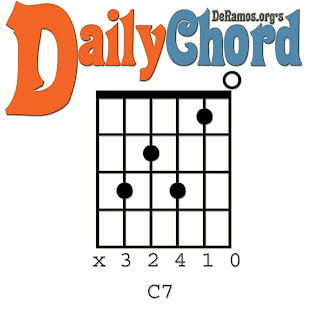 Avoiding the Low E string, strum the C7 chord. As you can feel/hear, C7 is basically the C major chord, with an extra note...a very twangy note.